MSR 2 Person Mess Kit. 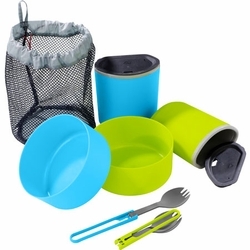 This versatile mess kit combines the bowls and mugs from the popular Trail Lite Duo System with two color-matched folding utensils. The whole kit is conveniently packaged in a breathable mesh storage bag.